The Neighbourhood Spaces Symposium is a three day event examining social and community practice through a variety of panels, presentations, discussions and activities. 3:30-5:30pm – Curator led tour of AGW exhibition Possible Futures: What is to be done? Mammalian Diving Reflex has been working with a cohort of children in their neighbourhood since the kids were 9 years old in 2005. Now, almost ten years later, the children – all turning 18 this year – are beginning to assume artistic and production leadership within the company. Artistic and Research Director, Darren O’Donnell and Young Mammals Director, Annie Wong will describe the models, its evolution and the nuts and bolts of the training process, while Sanjay Ratnan and Kathy Vuu will discuss their involvement in the company over the years. 10:00am-12:30pm – Mammalian Diving Reflex – Home Tours: Mammalian Diving Reflex invites you to join them on a walk through the nearby neighborhood, where we will knock on random doors and ask for tours of stranger’s homes. 1:15-2:45pm – Social Works: Varied Approaches to Participatory Activity: Sarah Fruchtman (Victoria, BC), Dr. Shauna Janssen (Montreal, QC), and Natalie Blaustone-Dye (Ashland, OR). Presenters will describe past projects and discuss how approaches differ based on a number of factors. This panel is moderated by Loree Lawrence. 3:00pm-3:30pm – SPAN, Listening Station: Over the course of the symposium, (SPAN) member Jacqueline Bell (Banff, AB) will be available to interview symposium participants. Each 20-minute session is designed as a peer-to-peer investigation built around a common set of questions, meant to get a sense of the range of ways that conference participants approach their practices. 9:15am-10:45am – The City: A Subject, A Place, A Partnership: Clint Sleeper (Reno, NV), Dan McCafferty (Windsor, ON), Cathy Masterson (City of Windsor Cultural Affairs Manager, Windsor, ON), and Greg Atkinson (Windsor, ON) will discuss using urban spaces in social practice. 1:15-2:00pm – Screening – Paradise City: Lisa Lipton (Halifax, NS) Paradise City was filmed over the course of Lisa Lipton’s Neighbourhood Spaces residency in the summer of 2013. 2:00pm-3:30pm – Curatorial Practice for Public Spaces: Andrew Lochhead (Toronto, ON), Stephanie Vegh (Hamilton, ON) will discuss their recent curatorial project Market Value, an interactive, performative series of works in Hamilton’s downtown Hamilton Farmer’s Market as well as other recent artistic labour and advocacy performance works. Rita Camacho Lomeli (Toronto, ON) will present on her involvement as a curator for Art of the Danforth, and Hiba Abdallah of Broken City Lab (Windsor, ON) will discuss past and future BCL projects. 3:45pm-4:15pm – Heidelbergology: Jenenne Whitfield (Detroit, MI) is the Executive Director of the Heidelberg Project. he Heidelberg Project began 28 years ago as an artistic protest and has now grown to become a pillar of Detroit’s creative community. It is from this perspective that the HP uphold the notion that a new philosophy is being born, Heidelbergology. 4:15-4:45pm – Social Practice for Recluses and Wallflowers: Rebecca Noone (Toronto, ON) will share her project Cues for Living. Her presentation examines the role of quiet gestures in social practice and shares some insights from world renowned physicists. It is our mandate to remove barriers to access and participation, we have several options available for anyone with limited funds. Neighbourhood Spaces invited socially engaged and community artists for 4-6 week residencies in various community sites throughout Windsor and Essex County, Ontario, Canada. Supported by the Ontario Trillium Foundation, this two-year program allowed artists to pursue research and/or create works that engaged, explored and connected with local communities. Neighbourhood Spaces encouraged artists to work in non-traditional spaces in non-traditional ways, embedding artists in community sites. 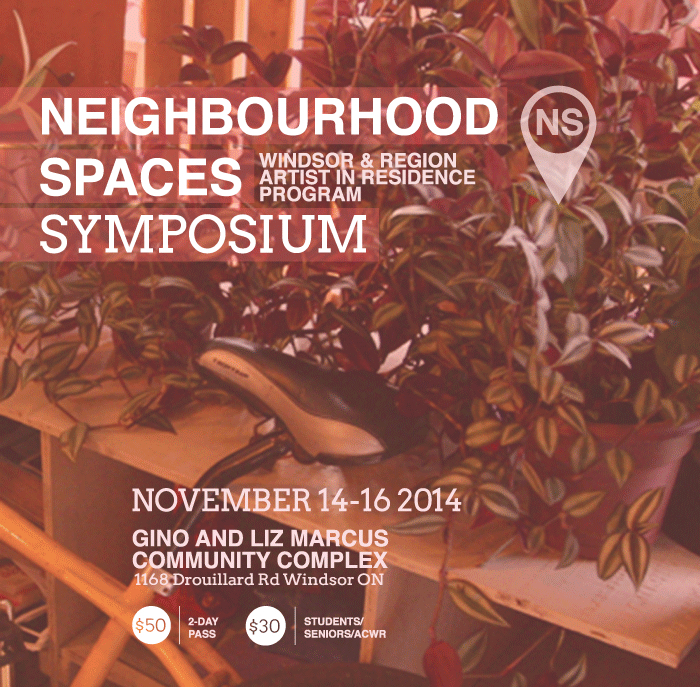 Neighbourhood Spaces is the product of a partnership between The Collaborative: Arts Council–Windsor & Region, Broken City Lab and The City of Windsor. This program is made possible through the generous financial support of the Ontario Trillium Foundation.